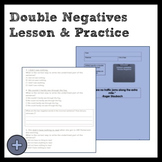 Place these task cards in a center in order to assess students' knowledge of double negatives. Students will rewrite the given sentences to avoid double negatives. These cards are formatted to be printed on 4x6 index cards for easy storage and durability. Laminate and reuse year after year! This is a 10 question quiz on double negatives. Students must rewrite each sentence correctly, eliminating the double negatives. Answer key is included. Also included in: Grammar Quizzes Bundle! 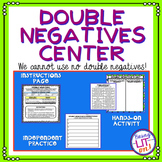 Students will play this game to help them develop the concept of double negatives in their reading and writing. This is a worksheet with notes on how to fix double negatives. It includes a practice section where students revise sentences containing double negatives. 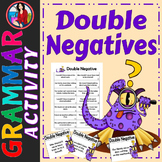 Double Negatives: Proof that a double negative equals a positive! Fun! Very simple and quick, this easy activity demonstrates how the use of two negatives in a statement actually equals a positive. Students will be left without a doubt! Word-Wise Language Arts Resources —100s of unique products over most-taught literature! Fun Teaching~Fun Learning!